Diversified Machine Systems (DMS), a leading U.S. manufacturer of 3 axis and 5 axis CNC routers and machining centers, will be exhibiting their popular line of 5 axis machines with a series of innovative video demonstrations to over 5,000 attendees at SAMPE 2013 Conference that held on May 7th – 9th in Long Beach, CA.The conference will include panel topics range from global composites, aviation and eco-innovative materials, to how educated workforces can reduce risks in composite manufacturing. 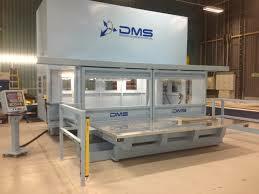 DMS expects it is a perfect environment for the company to illustrate how their advanced machining centers are an ideal solution for the material industry.“All of our DMS machining centers are engineered to improve production processes and create efficiencies,” said Ed Hilligrass, Executive Vice President. “Employed in a variety of manufacturing capacities, our routers are routinely used to machine composites, carbon fiber materials, metals, plastics, aluminum and more. We’ve worked closely with SAMPE for a number of years, and we understand the unique challenges faced by material and process engineers – our machines are specifically designed to address those concerns and help streamline production.”DMS also announced that the company will participate at various tradeshows to be held in 2013, including AWFS Fair, 22nd SPE Thermoforming Conference and EMO Hannover.2013 edition of SAMPE, an advanced materials and processes conference, will feature over 400 exhibiting companies. In addition, 10 concurrent tracks and over 300 presentations on the latest applications and market developments will be included.